Summary: If you go on holiday or are away from your office for a while, it’s really useful to be able to set up a Holiday or Vacation Response – which sends an automated email response to all your incoming mail. If you are using Outlook, Outlook Express or Windows Live Mail an effective method for setting up a Vacation Response is to set up a GMail account. 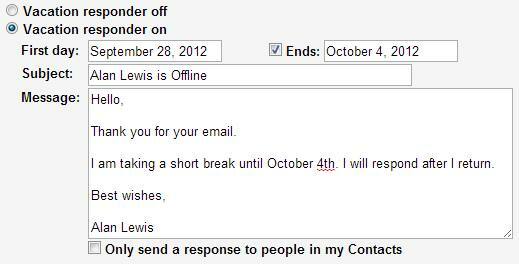 you can use Gmail’s Vacation Responder to send an automatic out-of-office response when you are on vacation. It’s a bit of trouble to set up at first, but it is really useful. Once you have it all set up you’ll really appreciate having it. Many years ago a mail storm occurred on our mail server. The lead engineer on our program had activated an email rule to forward all messages he received to the entire engineering staff when the subject line of the message contained certain key words. That produced an out-of-office reply from one of the recipients of the auto-forwarded message, which induced another auto-forward to the engineering distribution list, which induced another out-of-office reply. The ensuing mail storm took down the server. A Vacation Responder for Outlook, Outlook Express or Windows Live Mail? Incoming emails are responded to through a message rule that you set up. Note: If you are using Outlook on a corporate network which uses Microsoft Exchange, you can use the Out of Office Assistant. If you are not connected to a corporate network, and are using POP3 download your email into Outlook, there is no Out of Office Assistant. Going on vacation? No access to the Internet? No problem! Use Gmail’s vacation responder to let people know you won’t be able to get back to them right away. You can set up a vacation response in your Gmail settings that will automatically reply to anyone who emails you. While the vacation responder is enabled, Gmail will send a response to anyone who contacts you. If that person contacts you again after four days and your vacation responder is still enabled, Gmail will send another vacation response to remind the person that you’re away from your email. Check the box next to Only send a response to people in my Contacts if you don’t want everyone who emails you to know that you’re away from your mail. While the vacation responder is enabled, you’ll see a banner across the top of any Gmail page, displaying the subject of your vacation response. To stop Gmail from automatically sending the response, click end now within the banner. Or, if you’d like to edit the response, click vacation settings. Your vacation response will start over each time you edit it — if someone receives your initial vacation response, and then emails you again after you’ve edited the subject or body of the message, he or she will receive the edited response, too.